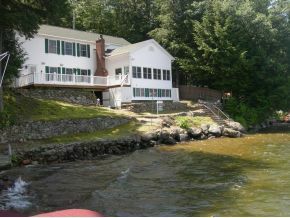 Custom built lakefront home with 100 ft of picturesque private frontage on Lake Winnisquam with views of three Mountain ranges, a 40 ft dock, raft, and mooring. Large Kitchen with Custom Cherry Cabinets with Pewter hardware, Beautiful Granite Counter tops, Recessed lighting, Viking Stainless Gas stove and Cherry Hardwood floors throughout. Hand forged lighting fixtures, Wrought Iron fixtures and Hand Stained Knotty Pine interior offers the feel of Lakeside living. 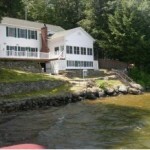 Enjoy two fireplaces or sit on the Year round porch and listen to the lake. Relax in the Large Master Suite with walk-in closets or soak in the Jacuzzi Tub. A large Two Bay Carriage house with a bunk room and tons of storage. All this situated on an extensively landscaped lot with Granite Steps and stone walkways. This well appointed home will not last priced to sell quickly! Listed by Exit Lakeside Realty Group. 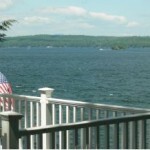 Winnisquam is just over 4000 acres with easy access off Interstate 93. 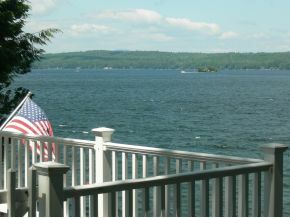 In addition to boating you are 20 minutes to Gunstock Ski Area and you can snowmobile to the rest of the state from your front door. Plenty of outlet shopping is just a few minutes away along with your choice of restaurants.